Over the past few years Facebook Page managers have all been noticing a trend. Since 2012 the organic reach of their Facebook posts have been in decline. Their suspicions were confirmed in 2014 when a study by Edgerank Checker found that between 2012 and 2014 average organic reach had dropped by over 50%, going from around 16% to around 6.5%! In this article we will explore what organic reach is, why it is important and what you can do to increase the organic reach of your Facebook posts. The total number of your followers that saw your post. The total number of other Facebook users that saw your post after someone else, liked, shared or commented on your post. Organic reach is so valuable to small businesses because it is essentially free advertising for your business. Every time you post a marketing message on Facebook it can potentially be seen by hundreds if not thousands of Facebook users, even users that don’t like your Page and are not familiar with your business. How Much Has Organic Reached Dropped? The result of Edgerank’s 2014 study means that a post from a Facebook Page with 1000 “likes” would only have been seen by around 65 people in 2014. Back in 2012 that same post would have been seen by around 160 people! Current studies suggest that Facebook’s organic reach could now be as low as 2%. In 2016 alone, Facebook organic reach dropped by over 50%. That same post that 160 people saw in 2012 would now only be seen by as few as 20 people! More bad news was to come in November of 2016 when Facebook announced that it had actually been overestimating organic reach. Up to that point, they had been including users who had a post in their News Feed, whether or not they had actually scrolled down far enough to view it. This change in definition is expected to drop organic reach by another 20%. Fewer users seeing your Page’s posts means fewer comments, shares and clicks. Fewer comments, shares and clicks means fewer potential leads or sales coming from the average Facebook post. 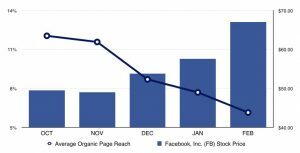 So why would Facebook decide to decrease organic post reach in the first place? Many marketers have accused Facebook of trying to force businesses to use paid ads to effectively reach their audience. While there is some truth to this, there are at least two other major reasons for the decline of organic reach on Facebook. The decline in Facebook’s organic reach has coincided with an increase of its stock price. According to DMR, Facebook currently has around 60 million small business Pages. Each one of those Pages post an average of 1.48 times per day. That’s almost 90 million posts per day, just from small businesses! With all that content being published, the average Facebook user will have around 1,500 posts appear in their feed every day. A user with lots of friends and lots of Page likes could see as many as 15,000! There are simply too many Pages producing too much content. Facebook can no longer show every post from every Page that a user likes. Each page now has to earn their space in user’s News Feed. 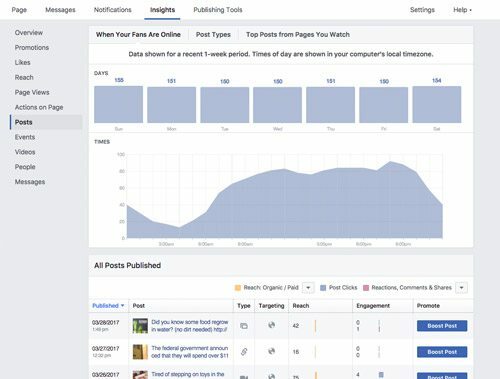 With the ever growing amount of posts being published every day, Facebook decided that they would try to only show the most relevant content to their users. 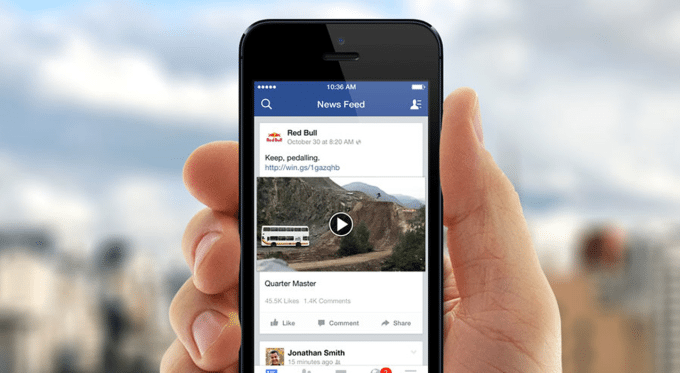 From Facebook’s point of view, a user has a much better experience when relevant content is shown. That user then spends more time on their platform. A user that is spammed with less relevant content won’t stay as long or return as often, which isn’t good for Facebook. With this in mind, Facebook built a News Feed sorting algorithm they called Edge Rank. When Facebook first launched the News Feed in 2006 it’s algorithm was pretty basic. Different post types (text, photo etc..) were given different values. It then multiplied that point value by the number of people engaging with the post. With that number Facebook could generate a ranking system for deciding the order in which posts would appear. Over the years the News Feed algorithm has evolved tremendously. It currently analyzes close to 100,000 factors when determining which posts are most relevant to each individual user. These factors include the recency of posts, the users interest in the publishing Page and how posts from the publishing Page have performed in the past. It also now includes machine-learning meaning that the current algorithm adapts to each user’s preferences. For example, if you never engage with photo posts in your News Feed, Facebook’s algorithm will notice and begin to show you fewer photos. A user that never engages with posts from a Page will also be shown fewer posts from that Page. Now that we have more information about how Facebook ranks posts, the question is how can we get our posts to show on more user’s News Feeds? Since user engagement with previous posts is now a ranking factor, Page managers need to change their strategy. The goal is no longer to get as much content out as possible but to get as much engagement as possible from each post. How do you know what to post? Check your Insights. Insights is Facebook’s built-in analytics suite. Facebook’s Posts Insights window allows you to see which days, times, post types and content perform best with your followers. Once a month, navigate to the “Posts” tab on the left side of Insights. From here you can see how each of your Posts performed as well as which post type and time of day tend to perform best. Use the information from your Insights to optimize your strategy for your next month of posts. When it comes to organic reach, video posts are a lifeline. Video posts have by far the highest average organic reach and engagement rate of any Facebook post type. Some of its executives have even predicted that Facebook will probably be all video within the next five years! Facebook is rapidly becoming a video-first platform. The next step in Facebook’s video strategy came with the introduction of Facebook Live video. Facebook Live is a live streaming feature added to Facebook in 2016. By pressing the “Live” icon you can start a live stream that your users can either tune into as it’s happening, or watch later. Not only do Live’s video posts typically outperform other post types, they also typically outperform other videos. This is because users that follow you Page will receive a notification when you “go live”. This increases your followers awareness of and interest in your live post. Facebook is now encouraging marketers to look at their platform as a way to make paid advertising more effective, rather than it being a free platform. The reality is that to be seen by a wide audience on Facebook now requires some advertising investment. Fortunately, advertising on Facebook is one of the cheapest and, when done correctly, most effective forms of advertising available to small businesses. For as little as $5 you can have one of your posts seen by thousands of people that would normally not know that you exist. You don’t want to boost just any post however. Instead, use Insights out what type of content your followers like and pick ones with the highest engagement rate. If your followers found a post engaging, chances are others will too! You also need to make sure that you get your targeting right. Focus on advertising to your ideal consumers. Casting too wide of a net can cost you a lot of money with little to nothing to show for it. For some great Facebook advertising tips, check out our Facebook advertising tips for small business. Facebook users based on demographics and interests. Existing customers or leads whose e-mail addresses you’ve captured using Custom Audiences. Users that are similar to your existing followers using Lookalike Audiences. People that have been to your website using Facebook’s remarketing feature. Tools like these can be the difference between a successful and an unsuccessful Facebook ad campaign. While there is a definite learning curve to using them, the improved results you will see more than make up for the effort. Way back in 2010, Facebook announced that they would be adding a “check-in” feature to their platform. Users would be allowed to “check-in” at a business to show their friends that they were there. This check in would appear as a post in their timeline. Today, the average Facebook check-in gets between 100 and 150 views. This makes check-ins one of the best sources of free exposure on Facebook. They allow your followers to advertise your business for you!